Try these trails before the snow flies. The path is worn into forest floor, stamped down by hundreds of hikers. It’s a popular place in the summer. But on a cool day in November, the month of frosty mornings and bare branches, she is the only visitor to sign the trail register of the preserve. The leaf peepers have departed, and a cold wind that smells of winter has driven many Mainers indoors. Their loss, she thinks. The mossy spruce-fir forest on Deer Isle is beautiful year round. As she walks the trails alone, she can’t help but feel the preserve is her own personal kingdom — for a few hours, at least. The trail network leads to a beach, and as she steps out onto the sand, a flock of seagulls take flight, startled by her presence. They wheel overhead, then settle to the water, bobbing on the waves. The visitor swings her backpack off her shoulders, setting it down in the sand, then digs through it for a windbreaker, gloves and a hat. Thus prepared, she plans to remain in the company of the gulls. Periwinkles roll under her boots as she walks the beach, drinking it all in — the shimmering waves, the salty wind, the bald eagle perched in a distant pine. She smiles, feeling lucky to be surrounded by so much natural beauty. November, she thinks, is the perfect time to visit some of Maine’s more popular trails. The tourists are gone, and so are the bugs. And while some of the beauty of the landscape has faded, it’s never entirely gone. The ocean retreats, revealing a sandbar that forms a bridge to a nearby island. She takes the silent invitation, shoulders her pack, and continues her adventure. The most popular preserve maintained by the Island Heritage Trust, Barred Island Preserve features 1.5 miles of nature trails that wind through a whimsical mossy forest to a sandy beach. A hot spot during summer months, the preserve is much quieter during shoulder season. In fact, you may have the beach and nearby Barred Island all to yourself. While visiting, it might be fun for you reflect on the history of the property. Thousands of years ago, Wabanaki people summered at the scenic location, fishing and collecting shellfish. And about 100 years ago, the property was a part of a family farm. If you time your visit with low tide, you can cross over a sandbar to explore the undeveloped Barred Island. 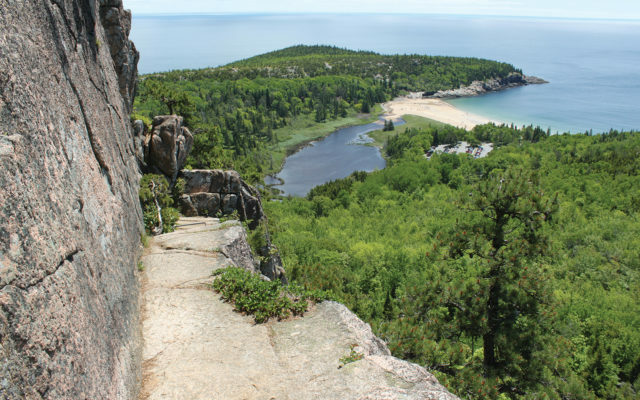 There are no trails on the island, and its forest is thick, but you can easily walk around the entire island on the large granite slabs that make up its shoreline, enjoying stunning views of Penobscot Bay. The preserve is open to the public for free for day use only. Dogs are not permitted. To learn more, visit the Island Heritage Trust website at www.islandheritagetrust.org or call 348-2455. Directions: Cross onto Deer Isle from Little Deer Isle on Route 15. After crossing the causeway, continue on Route 15, heading south, for 4.1 miles, then turn right onto Main Street. Drive 0.5 mile on Main Street, which turns into Bridge Street. At a fork, turn left onto Sunset Road and drive 2.7 mile. Turn right onto Goose Cove Road. Drive 0.3 mile and veer left at the intersection, staying on Goose Cove Road. Drive 0.5 mile and veer left at a fork, staying on Goose Cove Road and the parking area will be on your left in a few hundred feet. If the parking area is full when you arrive, a sign at the parking area asks that you leave and check out another preserve, saving Barred Island Preserve for another time. Towering over the famous Sand Beach, Beehive is a popular hiking destination for people who aren’t too afraid of heights. The 520-foot mountain features a steep 0.8-mile hiking trail that scales the cliffs on its south side. This trail includes metal rungs and ladders, as well as sections of cliff walking. It might remind you a bit of playing on a jungle gym, and it offers some spectacular views of the coast of Mount Desert Island. If that trail sounds a little too intense, there’s another option for hiking Beehive. About 0.2 mile into the hike, the trail comes to an intersection where you turn right to climb the steep cliff trail. If you continue straight at the trail juncture instead, following signs to “The Bowl,” you will climb to the top to Beehive on a much more gradual hiking trail. The parking lot for both Sand Beach and Beehive is usually overflowing during the summer, but that’s certainly not the case in late fall, after the vast majority of tourists have left the island. November is the perfect time to enjoy this spot, just be careful of ice on the trail. If ice is beginning to form, wear ice cleats or consider saving the hike for another day. All Acadia visitors are required to pay an entrance fee upon entry May through October. For all other months, access is free. Dogs are not permitted on the steep trail up Beehive’s cliffs, but they are permitted — if on a leash no longer than 6 feet long — on the more gradual trail up Beehive. For more information, call 288-3338 or visit www.nps.gov/acad. Directions: On Route 3, drive onto Mount Desert Island and veer left. Drive to Bar Harbor, continuing on Route 3 (Bar Harbor Road). Drive through the town and enter Acadia National Park. At the entrance of the park, turn left onto Park Loop Road. Continue on Park Loop Road to the Sand Beach parking lot, past the park entrance free station on the left. You will need to pay a small fee to pass the gate from May 1-Oct 31. From the Sand Beach parking lot, walk back to Park Loop Road. Turn right and walk a short distance. The trailhead is on the left. Rising 2,341 feet above sea level, Indian Mountain features a hiking trail called Laurie’s Ledge Trail that leads to two amazing outlooks near the mountain’s top. These outlooks offer two entirely different views of the region. The entire hike, out and back, is about 3.4 miles. And if you’re looking for a longer hike, you can also explore the 6.4-mile Indian Mountain Circuit, a trail that travels around the mountain to visit Horseshoe Pond. Located in the Appalachian Mountain Club Recreation and Conservation Area, Indian Mountain is only accessible by a gravel woods road that is not plowed in the winter. Therefore, if you want to drive right to the trailhead, you’ll want to hike this trail before it snows. The trail up the mountain is steep in several areas, and the climb is fairly constant. Watch your step for rocks and exposed tree roots on the trail. You may also want to watch for piles of moose poop. The first outlook, Laurie’s Ledge, is located just over 2,000 feet above sea level on the eastern slope of the mountain. There you’ll find a small wooden bench, where you can sit and take in the open view of the land to the east of Indian Mountain. To the right, you’ll see Gulf Hagas Mountain, and behind it, the bald White Cap Mountain. To the left of the mountain range, you’ll see First Little Lyford Pond and Second Little Lyford Pond. The second outlook, West Vista, is located a bit northwest of the mountain’s summit at about 2,300 feet above sea level, and offers a view to the west, which includes the distinct bump of Elephant Mountain, where a B-52 bomber crashed in 1963, killing seven men aboard. In front of Elephant Mountain are a number of ponds: Lost Pond, Mountain Brook Pond, Grassy Pond and Pearl Ponds. To the left of the mountain is the larger Horseshoe Pond and Blue Ridge. Dogs are permitted but must be kept under control at all times. To reach this hike, you’ll need to pay a fee of $7 per person to pass through Hedgehog Gate from May through October. During any other month, you can pass through the gate for free. For more information, call 737-9870 or visit www.outdoors.org. Directions: From the light at the center of Greenville, drive north on Lily Bay Road and turn onto the first road on your right, Pleasant Street. Continue on this main road for about 12 miles to Hedgehog Gate, where you’ll need to pay a fee to pass. (Exactly 2 miles from Lily Bay Road, Pleasant Road turns from pavement to gravel and becomes K-I Road.) Beyond the gate, continue 1.9 miles, then turn left onto Little Lyford Ponds Road. Drive about 2.1 miles and the first trailhead for Indian Mountain is on the left; continue another 0.2 mile and the second trailhead, which has more space for parking, is on the left.